Jason McMillan with a certificate of appreciation. The November 6, 2018 meeting of American Legion Post 227 featured a talk by Jason McMillan. In June, 2018, McMillan was hired by the City of Shoreline to be their Emergency Management Coordinator. He was introduced by Doug Sanders. First Vice Commander of Post 227. Post 227 is striving to be prepared to assist the public in the advent of an earthquake or other disaster and Sanders is leading the Post 227 effort toward that end. McMillan stated that the three most important things to have in a disaster are water, food and information. Each household should have enough water and food to last until the Federal Emergency Management (FEMA) or some other similar organization arrives to provide help. The length of time the stockpile of water and food should last is still under discussion. McMillan stated that is would be difficult for a family to stockpile enough water to last for more than a few days. Information will be vitally important during a disaster. It is likely that cell phones would become inoperable. Some local radio stations have capabilities to continue operating during a disaster, so families may be able to receive information using a radio receiver. Ham radio operators will be especially helpful during a disaster. After giving his talk, McMillan answered many questions from the audience. In response to a question, he stated that training for disaster preparedness is vital. When ordinary people are confronted by a disaster, the natural response is to get away from it. Through training such as that received by first responders, people can learn to head for the danger zone to provide assistance. 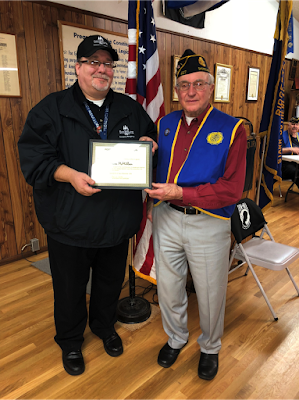 At the end of the evening, Post 227 Commander Larry Fischer presented McMillan with a framed certificate of appreciation.